Hyper Heat is a new home heating system designed by Mitsubishi. 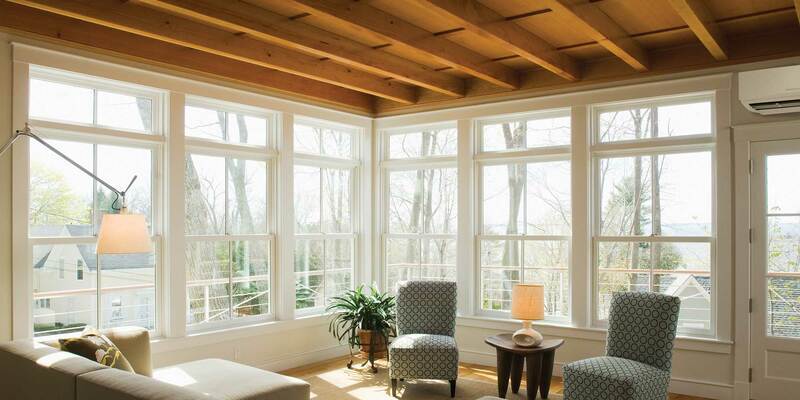 It’s the perfect home comfort solution for a range of homes and sizes, and has the advantage of being both a heating and air conditioning system that doesn’t rely on ductwork, making it a perfect option for older and historic homes that have relied on oil or radiator heat in the winter, and perhaps window air conditioners for summer months. Hyper Heat is a heat pump system, but it adds an exclusive Inverter technology that allows it to maintain its efficiency when temperatures drop, all the way down to -13 degrees Fahrenheit. By contrast, traditional heat pumps start to lose their efficiency when temperatures go below 40 degrees, requiring a backup system. So let’s take a look at last winter, and how a Hyper Heat system might compare to a traditional heat pump. In 2014, the Philadelphia region got clobbered with 68 inches of snow, and an ice storm that left many people in the outlying suburbs incapacitated for days. Last winter, while we only had 34 inches of snow, we had over 36 days where the low temperature was in the teens and single digits- making it more expensive to keep any home comfortable. This winter, who knows? The Old Farmer's Almanac predicts a snowier and colder winter than normal. We could get pummeled again with snow and ice, or see even more days of extreme cold. The extreme and prolonged cold days can mean unexpected energy costs for your home - and some people choose to supplement their existing heat pump systems which become less efficient when the temperature drops below 40 degrees - with traditional space heaters, which can be dangerous, and don't do a very good job of distributing heat throughout a living space. By contrast, Hyper Heat and its inverter technology allows for great performance down to -13 degrees, meaning owners of the system would have incurred zero additional fuel costs despite the extreme temperatures - a benefit for every wallet! Heat pumps work by removing heat from outside air, or the ground, and transferring it into your home or office to warm it. The process can be reversed in warmer weather, to remove heat from your home and transfer it outside, cooling the air. While heat pumps work the best in moderate climates, the more extreme weather fluctuations we’ve seen in recent years are playing havoc with the efficiency and benefits of traditional heat pumps, where performance drops rapidly as temperatures go below 40 degrees outside. Perfect comfort to Minus 13 degrees! Enter Mitsubishi’s new Hyper Heat system. Hyper Heat uses something they call Inverter technology by using a special phase-changing liquid, they can still withdraw heat from the surrounding environment until temperatures dip below -10. The best way to think of this is to compare it to an ice cream scoop with a heat exchange liquid built in. The scoop can remain warm enough to easily go through rock-hard ice cream, due to the phase-changing liquid in the handle - a kind of “anti-freeze”. 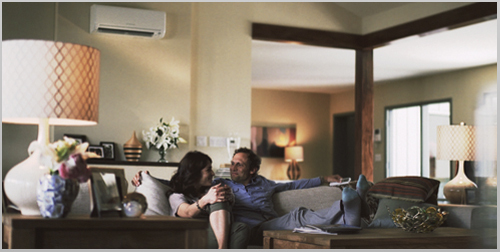 The same principle allows Mitsubishi’s hyper heat system to still extract heat out of the air and warm your home, even when temperatures drop well below the range where most heat pumps simply give up. Hyper Heat kicks in when the compressor motor is signaled that a burst of heat is required. The motor revs up to max speed and the systems funnels the additional heat thrown off the compressor magnets back to your blower, super charging your heat output and quickly responding to the dropping temperature outside. 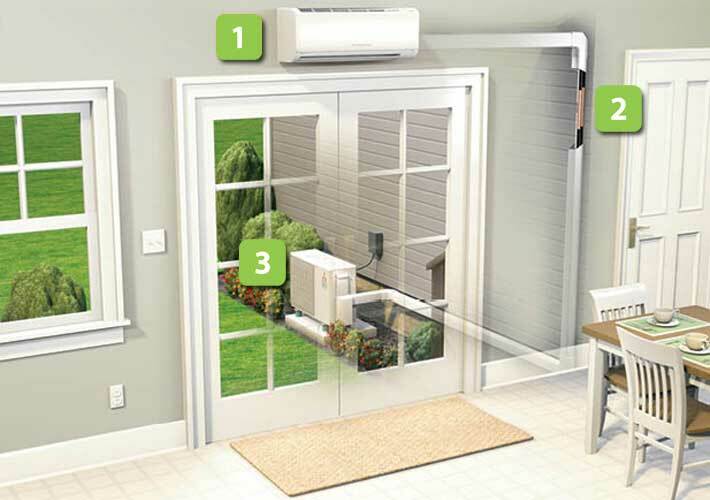 These Hyper Heat systems can cool your home in the summer as well, by reversing the heating process, that is, removing heat and humidity from your indoor environment and piping that excess heat outside. However, these systems are only as efficient as conventional air conditioning systems, and cost the same to run, meaning the bulk of the cost savings for homeowners will come by reducing the high cost of traditional heating fuels including oil, natural gas, and electric. I heard the word “ductless”- what does this mean? The other benefit of systems like Hyper Heat is that they can be installed to either work with an existing heating duct system, boosting efficiency, or as a “space heater” in areas that do not have or have room for traditional ductwork. If you live in a home with hard to heat spaces, like finished basements, garage workshops, additions, bonus rooms over a garage - anywhere where you might consider a space heater, electric baseboard or other device to boost comfort in an area, a ductless system might be just the solution you are looking for, without the danger associated with traditional space heaters. It can even turn your “three season porch” into a full year-round space for the whole family, and we’ve had several customers tell us it’s the perfect system to bring extra comfort to elderly relatives, who may not be as tolerant of cold as others in the family. 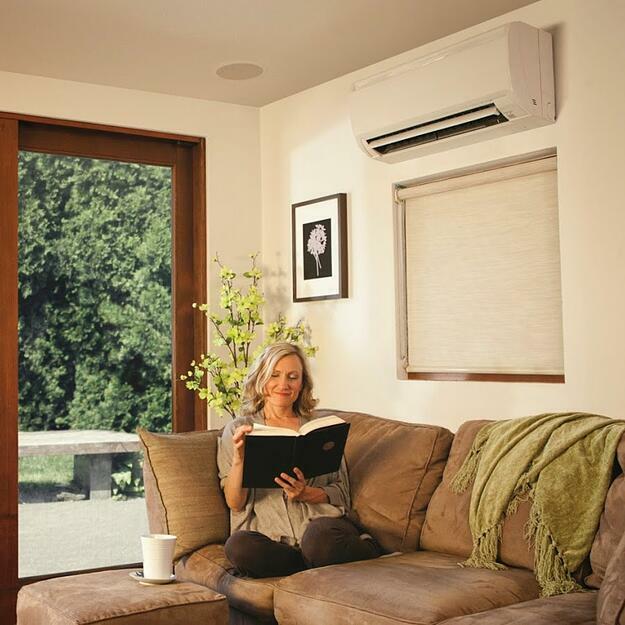 If you have a traditional heat pump that’s just not cutting it any more, an older home that doesn’t have room for ductwork, or rooms that are always cold no matter how high you set your thermostat, then give us a call or click the button below and learn more about what a Mitsubishi Hyper Heat system can do for you.